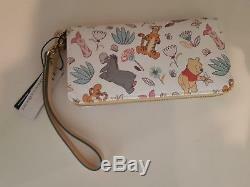 This zip around wallet from Disney features Winnie the Pooh and his friends, Tigger, Piglet, and Eeyore, surrounded by butterfly, bees, and flowers artwork. Dooney & Bourke have dreamed up plenty of pockets and compartments to carry cards, coins, and cash while visiting the Hundred Acre Wood or Disney's vacation kingdom. Pattern features Winnie the Pooh and his friends, Tigger, Piglet, and Eeyore. Screen art on coated cotton. Zip closure with leather pull. Detachable wrist strap with lobster claw clasp. 'Dooney & Bourke'' embossed metal label on front. Coated cotton / leather / metal. 4 1/4'' H x 8'' W x 1'' D (when closed). 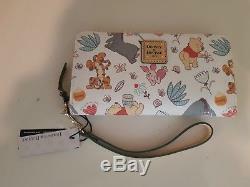 Part of the Winnie the Pooh Collection by Dooney & Bourke. The item "Disney Parks Winnie the Pooh WALLET by Dooney & Bourke" is in sale since Friday, July 13, 2018. This item is in the category "Collectibles\Disneyana\Contemporary (1968-Now)\Bags, Cases & Wallets\Handbags". The seller is "kouy618" and is located in Winter Garden, Florida.